Patio Umbrella Frame - Durable Aluminum or Classic Wood? The patio umbrella frame consists of the pole, the ribs, the finial and the mechanism for opening and closing the umbrella. 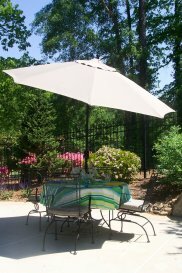 Most patio table umbrellas are made of either wood or aluminum or aluminum with fiberglass ribs. 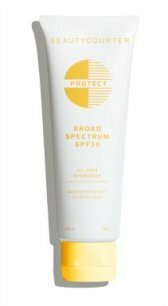 Deciding what frame you want will help you decide what sun protection umbrella to buy. Depending on if you are planning on storing your umbrella, the options for an umbrella pole are a one piece or a two piece pole. We have a 9' and an 11' patio umbrella - both with a crank for easy opening and closing. We also have a small 6' umbrella that sits by our chaise lounge - with this smaller size, the opening mechanism is not that important . It is a simple manual life with a pin that fits in a hole to secure it. Also because I am short, the pulley system or manual lift was not practical for me. A tilt patio umbrella provides shade no matter where the sun is. 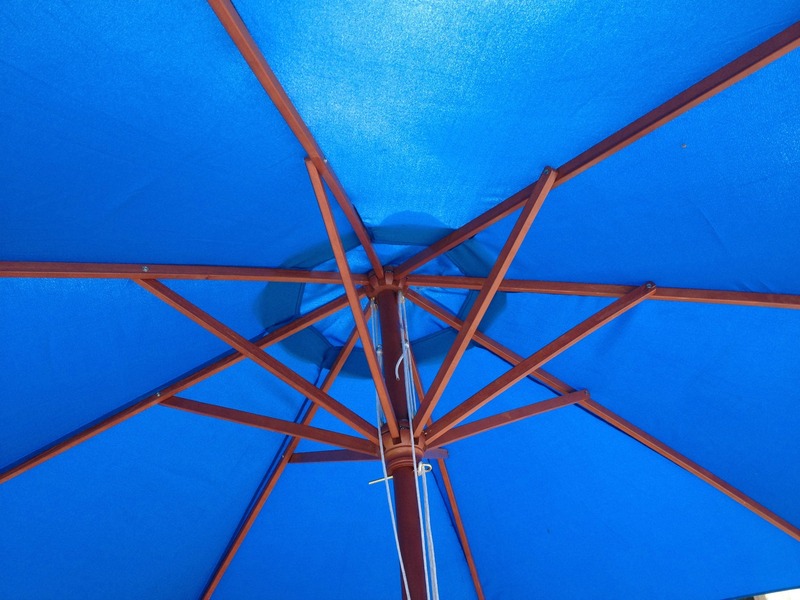 Outdoor patio umbrellas without this feature can still leave one sitting in the bright sun. 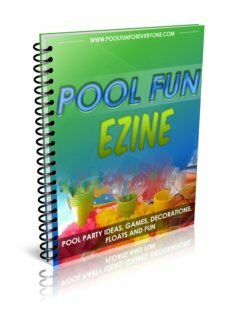 So if you are going to invest in a new pool umbrella, this is an important feature to consider. The crank lift makes it easier to open the umbrella. Simply crank a handle at the base of the umbrella and it opens right up. 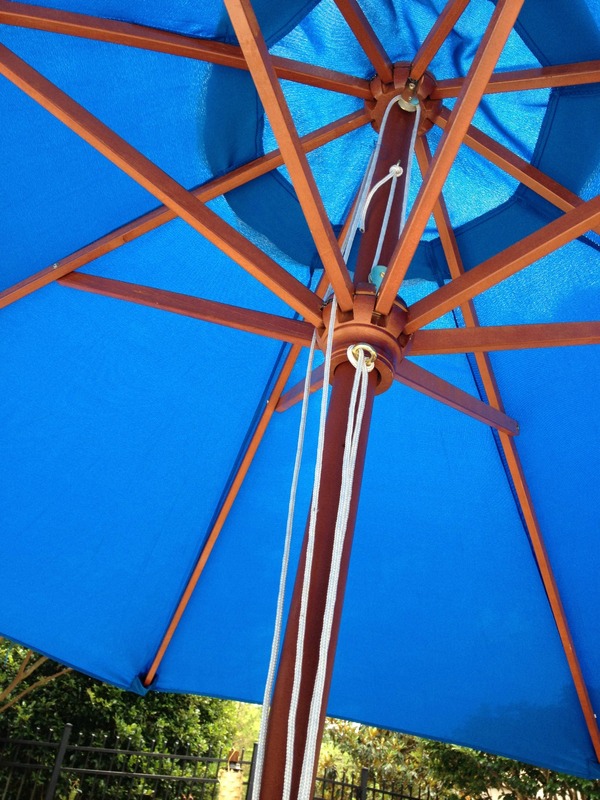 A wooden umbrella has a manual or a pulley system. If you are short like me, the pin is set too high for me to comfortably reach. After the umbrella has fully opened, simply crank the handle one more time and the umbrella automatically tilts. There is also a push button tilt, which tilts the umbrella by pressing a button near the top of the pole. The button is up to high for me to reach - so I like the crank tilt better. An aluminum pole and ribs is the most practical patio umbrella frame. It offers a more light weight, but durable and strong umbrella. There is more variety in the color selection for this material as well. More features can be found with an aluminum frame - like the crank lift with the automatic tilt. If your pool umbrella was blown out of the base after a strong gust of wind, the aluminum pole is less apt to break than a wood pole umbrella frame. 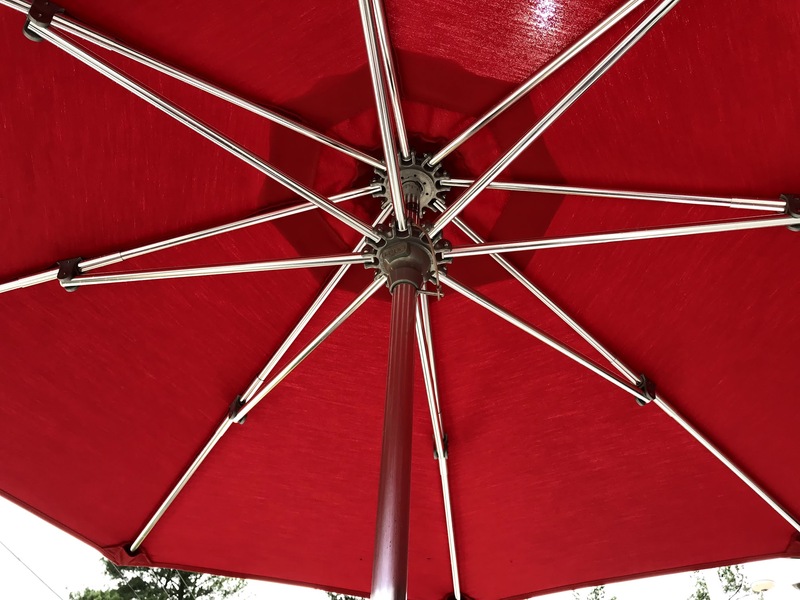 What we like best about our aluminum umbrella is that it has a tilt feature - typically a wooden market umbrella does not. 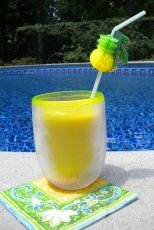 An aluminum umbrella pole is available in many different colors and finishes to match your patio umbrella fabric. We recently bought an outdoor umbrella with a wooden pole and ribs and in less than two weeks, one of the ribs cracked. Sometimes you have to pay more for an aluminum frame, but for durability, it's worth it. A wood umbrella provides a classy and rich look to your outdoor pool area. They are now available with a crank lift, including a tilt feature, as well as the traditional push up or pulley and pin lift. The downside to a wood frame is that it is weaker than aluminum and more apt to snap. If you want to keep your wood market umbrella looking like new it does require some maintenance, unlike an aluminum frame. A wind resistant umbrella will typically have an aluminum pole, but with fiberglass ribs. Fiberglass ribs are most often used in wind resistant patio umbrellas. They have the ability to give and bend, where the wood ribs do not. If you live in a windy area it's best not to buy a patio umbrella frame made of wood, unless you are diligent about closing it and tying it up when not in use. Instead consider a wind resistant umbrella frame made of fiberglass. This one made by California Umbrellas is durable with a high quality mechanism and the tilt feature and 8 heavy duty fiberglass ribs.